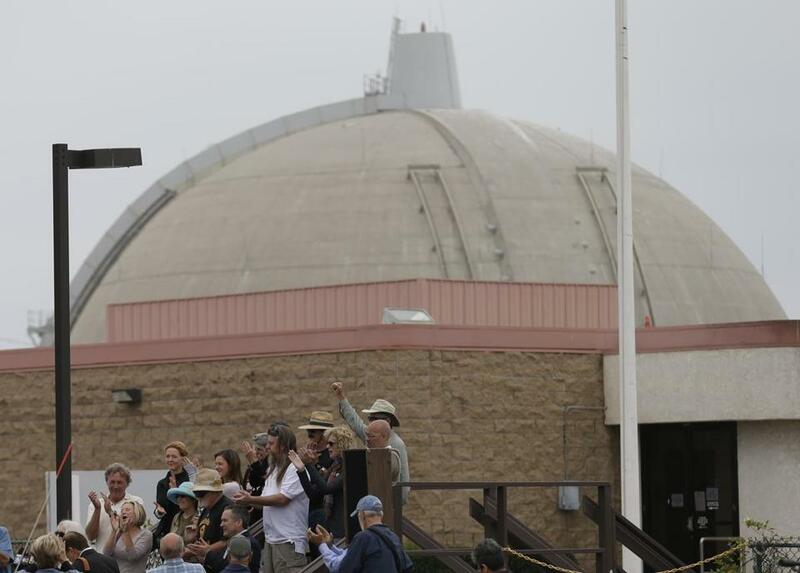 The San Onofre plant between San Diego and Los Angeles has closed. Of 119 US reactors, 20 are now being decommissioned and a half-dozen more are expected to close early. Midway between San Diego and Los Angeles, the San Onofre Nuclear Plant waits to be dismantled. After more than 40 years of protests, lawsuits, and safety scares, its two concrete-encased reactors, jutting from the pristine California coastline, are powered down and its massive steam turbines, once deafening, are quiet. For the activists who fought to close the plant, the victory is bittersweet. The reactors will disappear, but 1,600 metric tons of radioactive waste remain. While some is stacked in steel-lined casks, and the rest is submerged in cooling pools, all of it is trapped in a political and regulatory limbo that keeps it from going anywhere anytime soon. And San Onofre isn’t alone: More than 76,000 metric tons of waste is stranded at dozens of commercial sites, just as the United States approaches a critical mass of nuclear-plant retirements. Under a 1982 law, the US government, not the utilities, is responsible for disposing of radioactive waste that can take thousands, even hundreds of thousands, of years to degrade. But more than a half-century after nuclear energy powered the first American home, the US Department of Energy still doesn’t have a permanent solution for the waste left behind. It’s a problem that will only get worse. On Oct. 24, the Fort Calhoun Nuclear Generating Station near Blair, Neb., became the fifth nuclear plant to close in five years. Of 119 reactors in the United States, 20 are now being decommissioned and a half-dozen more are expected to close prematurely, nudged out by cheap natural gas and growing use of renewables. Beyond that, ‘‘the big wave of retirements really starts coming in around 2030,’’ Energy Secretary Ernest Moniz warned last month at an event in Washington. Among experts, the nuclear waste debate invariably turns on the fleeting nature of human institutions in dealing with an element that the Environmental Protection Agency has said must be isolated for 10,000 years to protect humans and the environment from toxic radiation. That’s one issue. A second is where exactly to put the waste. The safest thing to do is to bury it deep underground, below the water table, and within a stable rock formation. Congress picked such a site in 1987: a desert ridge in Southern Nevada known as Yucca Mountain. The site abuts a nuclear weapons testing ground where 928 atomic tests were conducted between 1951 and 1992. While a few Nevada counties agreed with the selection, the state government didn’t, and the Yucca solution soon devolved into a decades-long political fight that crossed party lines and spanned presidential administrations. In 2010, President Obama finally scrapped the plan altogether, declaring the site unworkable. Moniz, whose agency has primary authority for disposing of the waste, is hoping to overcome the problem, at least for the short term, by using interim storage sites built by the private sector, he testified before Congress in September. Last month, the DOE for the first time began soliciting public comments on that proposal. But plans for two private facilities are already facing flak. Last month, a collection of antinuclear, environmental, and consumer advocates demanded in a letter that the commission dismiss a license application by Dallas-based Waste Control Specialists LLC that offered up such a plan. The Texas facility, which the company said could be in place by the end of 2021, would store as much as 40,000 metric tons of waste, for as long as 40 years. In their letter, the plan’s opponents argue that the Nuclear Waste Policy Act of 1982 bars the federal government from taking responsibility for interim waste in the absence of a federal repository. ‘‘I think it’s a rather hollow argument to say the least,’’ said Chuck McDonald, spokesman for Waste Control Specialists, adding that the company couldn’t comment on the groups’ criticism of the NRC and the Energy Department. McDonald said the concept of interim storage came out of the Obama administration’s Blue Ribbon Commission on nuclear waste. ‘‘This idea didn’t come from Waste Control; it came from the federal government,’’ he said. Allowing an interim site ‘‘lets the utilities off the hook,’’ making them less inclined to push for a permanent solution, said Mindy Goldstein, an Emory University law professor who coauthored the letter. Another concern: ‘‘Private owners will be cutting costs at every turn to maximize profits,’’ said Tom Smith, director of the Texas office for Public Citizen, a consumer advocacy group. ‘‘That’s an inaccurate and unfair assumption that minimizes the oversight role of the Nuclear Regulatory Commission and the US Department of Energy, who both have a pretty good track record as does Waste Control Specialists,’’ company spokesman McDonald said. The other company proposing to host the waste, Holtec International Corp., declined to comment on the letter. ‘‘We have remarkable support,’’ said Ed Mayer, program director for Holtec, which plans to store 120,000 tons of waste at its facility in New Mexico. The support comes from the counties where the facility would be located as well as nearby cities and state officials, Mayer said. Holtec will submit its application for a license in March 2017, with the site expected to be in service by 2022, he said.